Personal / Outages / Common Questions / What can I do to help prevent outages? What can I do to help prevent outages? There are two ways in which you can help prevent outages: keeping your trees trimmed and away from power lines, and checking before you dig on your property. Overgrown trees not only cause outages, they also prevent our crews from repairing equipment quickly and delay the process of restoring power. Trees on private property are the responsibility of the property or business owner whereas trees on public roads are the responsibility of Auckland Council. Under the Tree Regulations you are legally required to keep any trees located on your property a prescribed distance from network lines. You can find out more about your obligations as a tree owner here. Prefer watching a short video? The video below is a quick overview (1.2 mins) of keeping trees away from power lines. Underground electricity cables and gas pipes are everywhere. They could be under your lawn or driveway. 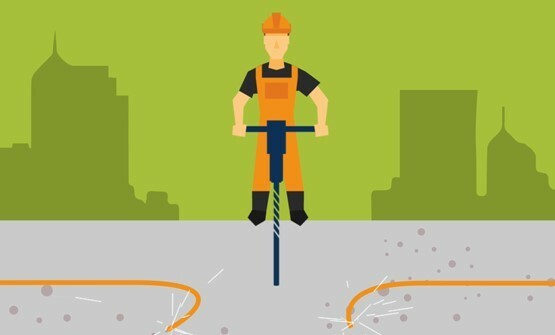 You could hit an underground electricity cable or gas pipe which could result in injury to you, and loss of service for your neighbours. Before you dig, request free reference maps which show the approximate location of underground cables and pipes at least two days before you begin work. Call 0800 B4UDIG (0800 248 344) to find out the location of electricity cables or gas pipes under your property. If you have cables or pipes below, make sure you avoid digging in their location. If you are breaking concrete and need equipment such as a rock breaker or excavator to dig but have established that there are cables or pipes nearby, make sure you get a professional contractor to carry out initial digging work. For more information on reference maps, please click here.